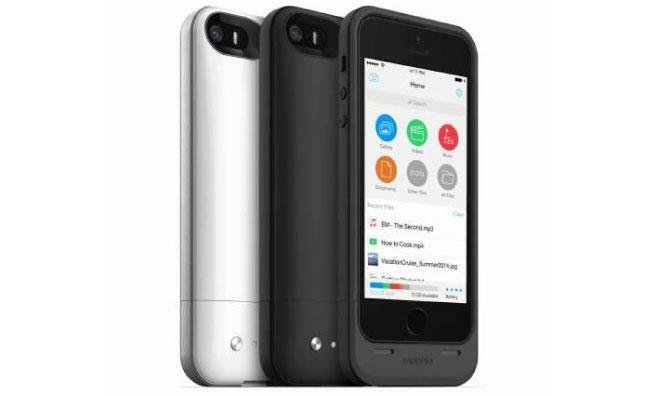 Accessory maker Mophie on Tuesday unveiled the Space Pack, a new variant of the company's popular iPhone battery cases that grafts up to 32 gigabytes of external storage onto Apple's iPhone 5 and 5s. Mophie says the Space Pack is designed to enable iPhone owners to keep more photos, videos, and music directly on their devices, rather than depending on cloud storage that may or may not always be accessible. The Space Pack can also provide enough power to double the iPhone's battery life, a combination that Mophie claims is the world's first. CEO Daniel Huang said that Mophie "wanted to create a product that enables iPhone users to truly enhance their experience by solving some of the core limitations of smartphones." The Space Pack's storage can be managed either on a user's desktop computer or via the new Mophie-designed Space app. The app allows users to play back music and movies and view documents stored on the Space Pack and provides quick-sorting options that let users browse the contents of the Space Pack by file type. In addition, the Space app features AirPlay and AirDrop integration for wirelessly streaming files to home entertainment systems or transferring data between iOS devices. The 16-gigabyte Space Pack will set buyers back $149.95, while the 32-gigabyte model will cost $179.95. Both capacities are available for pre-order today at mophie.com and the company expects shipping to begin March 14.